We’ve been there. As convenient and useful as a cat tree can be, very few of the many products out there offer a great design to our delicate tastes. 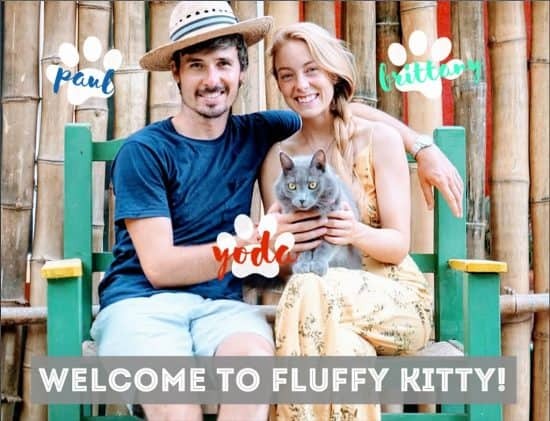 Luckily, a few people heard our prayers and responded with products whose elegance will save the modern and stylish cat owner. 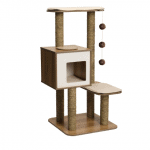 Let’s find out how to climb and scratch in style with the best designer cat tree furniture! Yes, your Fluffy Kitty deserves the best but it does not mean that you should butcher the style of your apartment in the process with a normal, carpet-covered cat tree! 😉 See our selection at a glance below. 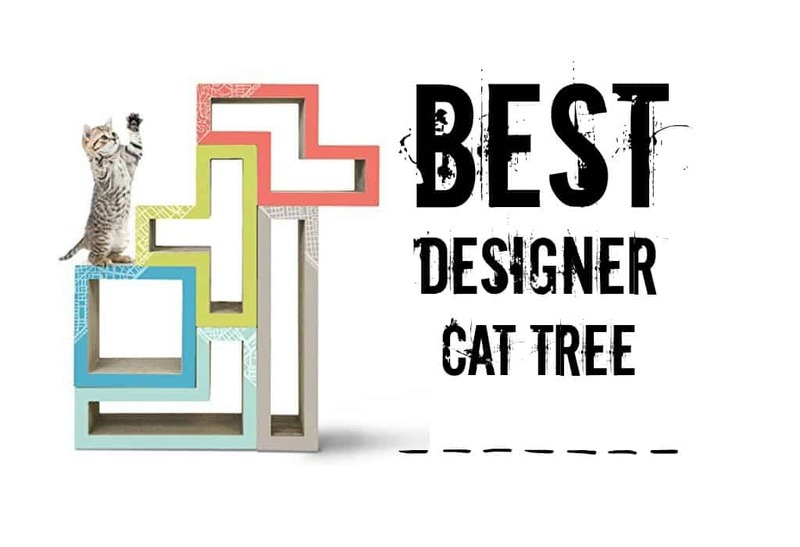 Let us introduce you to one of the very best designer pieces of cat tree furniture out there. It’s actually been available for quite a while and has become a reference in the world of cat trees. With its very rich dark chocolate brown and its smooth curves, you will surely fall in love with this meowsterpiece! Everything fits as it should: It takes some time but it’s easy to assemble with the provided picture instructions. A high vantage point: At 69 inches above sea level, this tree offers the highest view from our selection of the best designer cat trees. Very sturdy: Despite its impressive height, it stays in place very well even when the kitty gets crazy! Large platforms: Ideal when you have a larger cat and/or multiple cats in the house. Enough room for everypawdy at once! Replaceable pads: Both the carpeted parts and surface covers are replaceable. This cat tree is definitely made to last. Looks like a piece of art: Its sleek design will surely receive some compliments! When compared to other carpet covered cat trees available, its height, the number of sitting places, the little cubby hole at the bottom and the padded box top, combined with the fact that it is an attractive piece of furniture that is way more resistant than the standard cat trees, we really feel that it’s worth the price! Not to mention that it’s also the house cleaner’s best friend: it does not shed carpet threads all over the place. The Feline Lotus cat tree is a blend of symmetry, functionality, and minimalism! What’s not to love!? If you cannot stand the aesthetic of a regular cat tree but still want to provide a good climbing structure for your cat, this designer cat tree is definitely made for you! A bit less functional for some cats but still a great compromise. Easy to assemble: This cat tree is one of the easiest to put together. The provided clips system is spot on, making the ensemble stick together very nicely. Very versatile: There are loads of configurations possible depending on your taste! One really cool thing is that you can add on as much as you want to make the structure bigger for your cat… or for you! Incredible design: Indeed this cat tree is a very well crafted piece of furniture that you can use as a bookshelf, a coffee table, a shoe rack or even a bedside table. It integrates perfectly in your home which is why it made our list of the best designer cat tree furniture. Eco-friendly: This cat tree is for the cardboard junkie cat! Well, it’s actually pretty much good for everyone. You preserve the environment by buying a recyclable product and kitty is happy as the entire structure is cat claw friendly. We’re talking corrugated cardboard which means it’s remarkably sturdy! It won’t last as long as the refined feline but it will still do the job for a while. It can hold up to 300 pounds! No worries for your larger beast! It’s worth mentioning that the price is one of our main concerns with this product. You pay for a very beautiful and unique design but you should keep in mind that it is made of corrugated cardboard. It will not look the same after a year of intense scratching! Also worth highlighting the fact that this structure works best against a wall when you want to reach a certain height. If your beast gets in crazy parkour mode (which could happen with the included catnip), you have to make sure that the structural units stay in place! Whether it is for a nap in the square or just to observe his kingdom from the very top, this cat tree will surely conquer your cat’s little heart. This is one of the best designer cat tree furniture out there! We highly recommend for the designer-savvy cat lover! Now, this piece of furniture definitely looks more like your habitual cat tree but it’s nonetheless far from those “cardboard and carpet monstrosities”. 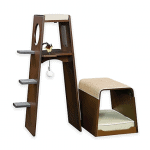 Its design has been very well studied to provide both you and your cat with an attractive yet functional cat tree. Innovative design: It looks like a regular cat tree with its similar-looking platforms and sisal posts. However, the comparison stops there! The platforms are larger and equipped with amazing memory foam cushions and provide plenty of resting/playing space. The cute cave is perfectly crafted and adjusted to the global structure. The sisal looking posts are actually made of seagrass which is smoother, less “prickly” and smells pretty good too! Top notch quality: This cat tree furniture is extremely well made! It is made of high-quality MDF made from New Zealand pine. 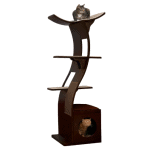 The craftsmanship on this piece is simply exceptional and will make you understand the definition of a great cat tree! The only drawback that comes with this tree seems to be its assembly. The instructions are far from precise which may or may not make you want to kill yourself in the process. If you love your cat, it’s definitely worth it! Thankfully, a helpful soul made a video that will enable you to get the work done in no time. This cat tree is definitely solid, stable, aesthetically pleasing, and in every way superior to those heinous cardboard-and-carpet trees that you can get—often for very nearly the same amount of money! 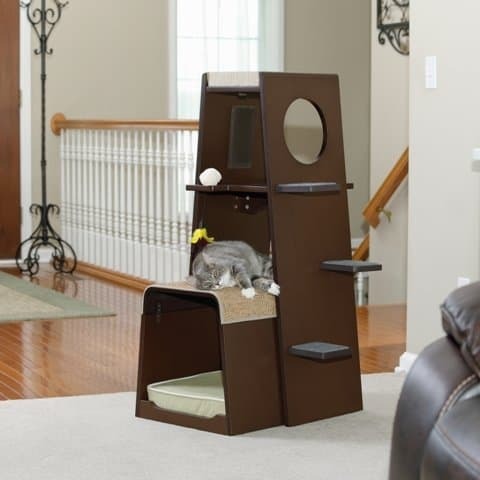 Last but not least, this modern and chic cat tower will amaze you by its efficient design! It is made by the very experienced Ohio-based, family-run company Sauder woodworking Co. which offers a wide range of furniture. They know their stuff and they prove it with this beautiful cat tree. Super sturdy & interactive: The cat tree for exploration and adventure! 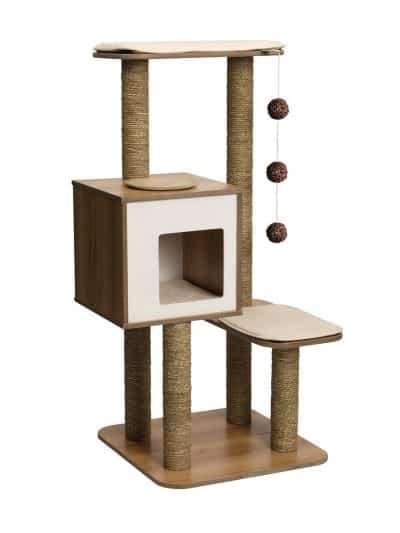 This cat tree has everything a cat needs: perfect spaces, padded climbing steps, molded bristles for face rubbing, and two sisal pads for climbing and scratching. Wonderfully well-equipped: As an extra, this tree comes with a replaceable scratch pad and a small toy on a bouncy elastic string. This feather toy is weighted by a fuzzy ball which causes more movement that will guarantee hours of entertainment for your beast! It also has a two-sided, removable memory foam cushion with zippered fabric cushion. What’s not to like about this modern cat tree? 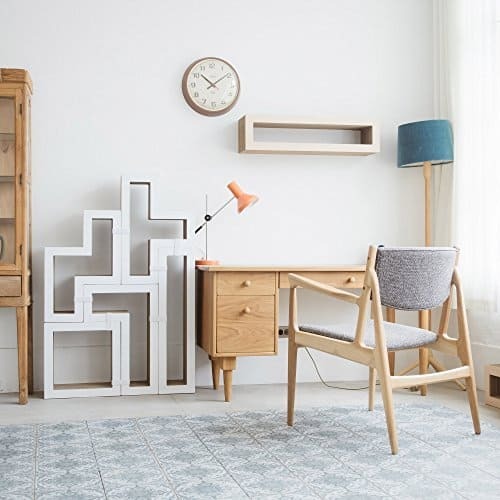 It’s functional and will blend beautifully with your existing furniture. We fell in love with its contemporary design and the dark and classy color palette. Lifesavers–that’s what the best designer cat tree furniture is for! They will spare you from those carpeted cat trees and add design and modernity to your home. What’s really great about them is that those products are a compromise between two worlds. They take into account kitty’s climbing and scratching needs as well as the parent’s need for style and elegance. 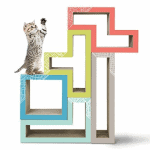 We hope you were able to find the best designer cat tree furniture!